Paris, a city renowned the world over for its landmarks and culture, its history and cuisine, became the focal point of the international campaign for an asbestos-free world on October 12 and 13, 2012. 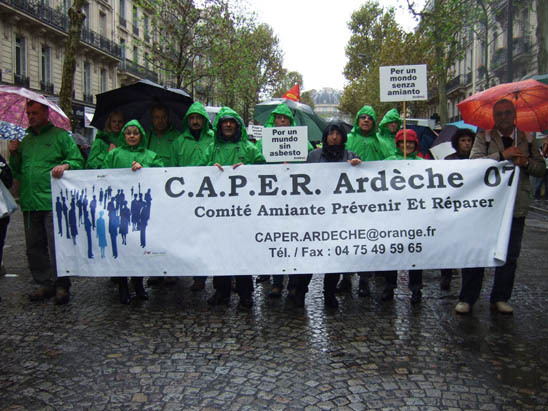 Representatives of asbestos victims' groups, campaigning bodies and associations involved in the struggle to end the global use of asbestos converged on Paris at the invitation of Andeva, the French umbrella group representing scores of local victims' associations. As we made our way through the city to various meeting points, we passed by monuments and locations imprinted on the consciousness of all humanity: the Eiffel Tower, the Seine, the Louvre, the left bank, the Champs Elysee. 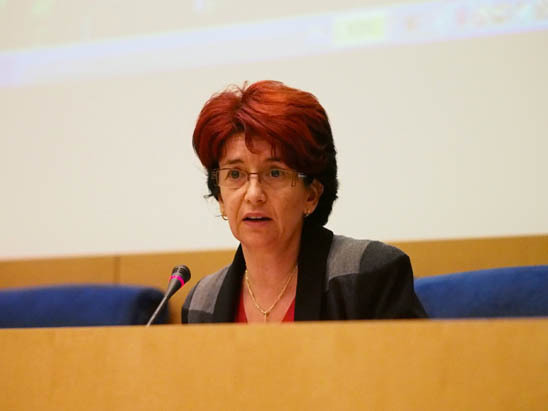 It was, of course, totally appropriate that efforts to secure justice for the asbestos-injured and end double standards regarding asbestos use took place in the French capital, the site of so many battles over human rights, social justice and the political entitlement of citizens. 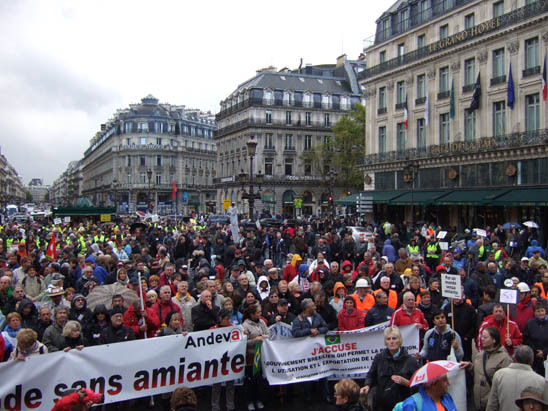 Delegates from 20+ countries on six continents took part in the Andeva events as did thousands of French activists representing victims' groups from asbestos hotspots such as Charente, Languedoc, Roussillon and Ardèche. The activities, which had been almost two years in the planning, began on the evening of Thursday (October 11) in St.-Germain-des-Prés when international delegates were given the opportunity to mingle with colleagues at a bistro  Aux Charpentiers  that had been providing hospitality for over 150 years. As old acquaintances were renewed and new friendships were born, participants expressed their anticipation of what the coming days would bring. 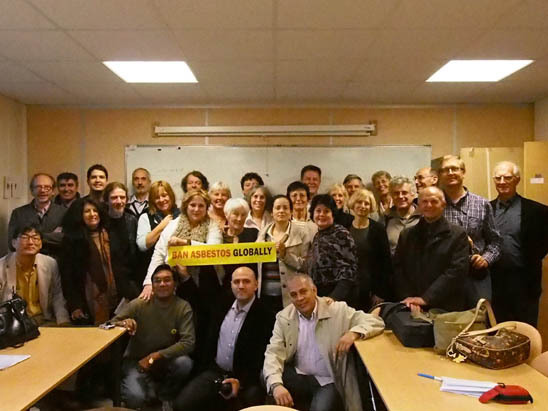 At the heart of the Paris mobilization was the conference on Friday (October 12) entitled The International Day of Asbestos Victims. As we passed through the portals of the Palais du Luxembourg, the seat of the French Senate, the high-profile nature of this meeting was reinforced by the grandeur of the building. Welcoming delegates, Senator Annie David thanked the organizers for allowing the Senate to host such an important debate. In many developing countries, such as Mexico and India, the debate on the rights of those suffering from asbestos-related diseases has barely started. exported human misery around the world. Calling the Canadian asbestos industry evil and corrupt, he said that government support for asbestos producers had been corporate welfare for corporate serial killers. At the end of his presentation, Mr. Martin paused for a few moments and then apologized for the past conduct of the Canadian government. His remarks were warmly received by the audience. Senator Lisa Singh from Australia described the proactive stance her Government has adopted on asbestos, including the publication in August 2012 of The Asbestos Management Review, a document which delineated a national asbestos plan to reduce the incidence of asbestos-related diseases in Australia.2 Because of the widespread use of asbestos in the construction of domestic properties and the popularity of DIY in Australia, there is great concern about a third wave of asbestos victims, such as handymen and families living in houses where renovation projects are undertaken without due care and attention. It has been estimated, the Senator said, that in the next 40 years, 25,000 Australians will die from mesothelioma, an aggressive type of asbestos cancer. Responding to public anxiety about this state of affairs, the Labour Government has pledged to make every effort to ensure that new exposures to asbestos are eliminated. 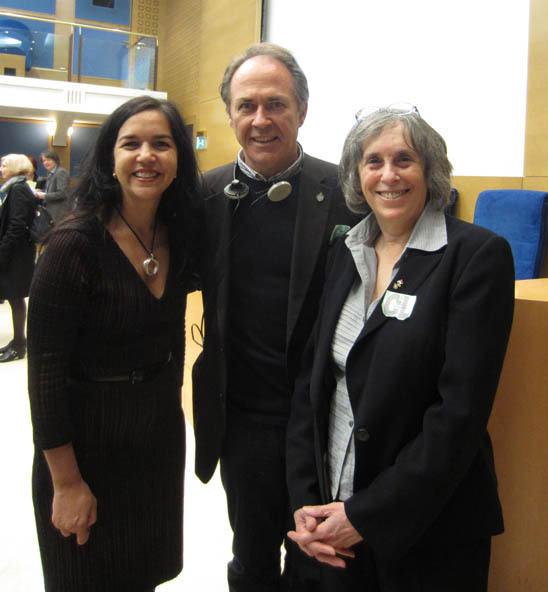 Senator Lisa Singh, MP Pat Martin and IBAS Coordinator Laurie Kazan-Allen. The annals of the conference will be published in due course and the English and French audios of the conference will be made available by Andeva. As could be anticipated with such a crowded agenda there was a great deal of new information being conveyed. With such a tight timetable, delegates used every available opportunity to continue the discussion during the lunch and coffee breaks. The presence at the conference of journalists and TV reporters from France and abroad ensured media coverage of the event; items have indeed appeared in the French press, on French and Brazilian TV stations as well as on the internet and social media sites. This, the first international conference organized by Andeva, was judged a success not just for the content shared but also for providing the opportunity for asbestos victims' groups from around the world to develop closer ties so that future collaborations might be pursued. On Saturday morning a roundtable session was held in a seminar room in the Mathematics Department of Jussieu University. The symbolism of this location did not go unnoticed. Many of the older buildings at Jussieu had been contaminated with sprayed asbestos insulation; in fact at one time Jussieu was declared to be the biggest asbestos-contaminated site in Europe. 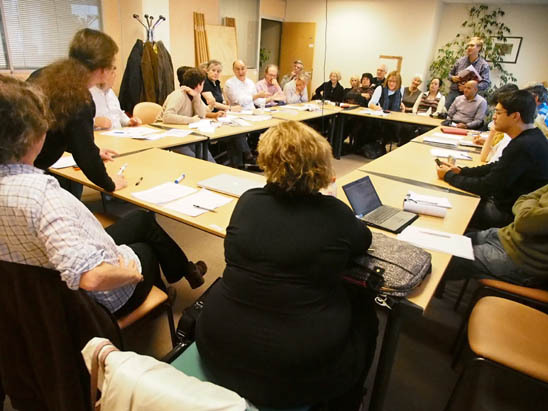 The French ban asbestos movement, which had been spearheaded by asbestos textile workers from Clermont-Ferrand, had been strengthened when their academic allies from Jussieu joined the struggle.3 During the three-hour discussion on October 13, a great number of issues were considered and strategies explored. 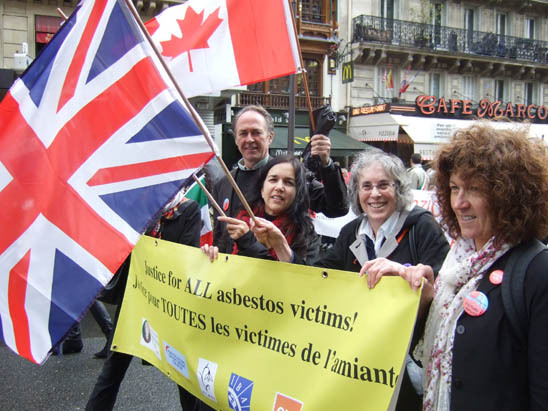 While French asbestos demonstrations have been known to attract large crowds, the same cannot be said for protests in many other countries, my own included. It was for this reason that I was particularly anxious to take part in the public rally scheduled for Saturday afternoon. By the time we arrived, having been delayed due to the need for some revisions to the texts described above, there were already a large number of groups present in the Avenue de Messine, about 3 kilometers from the destination of the march: Place de l'Opera. Two busloads of Italian asbestos activists had made the journey as had coachloads of asbestos activists from all over France. The colorful banners, flags and placards created a fluid and exciting atmosphere while the coordination of various groups  some in green rain jackets, some carrying orange umbrellas  brought a patchwork of color to the affair. Despite the grey skies and drizzle, which was soon to become a downpour, the atmosphere was jovial and supportive. I found an Italian marcher holding the Union Jack while waiting to be relieved by a British person. French people were carrying signs written in English while Italians were carrying signs in French. As we made our way through the boulevards, led by the Andeva contingent, roads were closed off by police outriders. About half-way to our destination, noises started erupting behind us with people booing and whistles being blown as we approached 10 Avenue de Messine, formerly the headquarters of the infamous Permanent Committee on Asbestos; for decades this lobbying group set the French Government's pro-asbestos agenda. Another place of shame on the Rue de la Pépinière was soon in sight; it had been the location of the French Asbestos Association. By this time, the rain had become torrential but nobody seemed to take much notice. It was wet but so what  we were together and the spirit of solidarity kept us walking towards our goal. 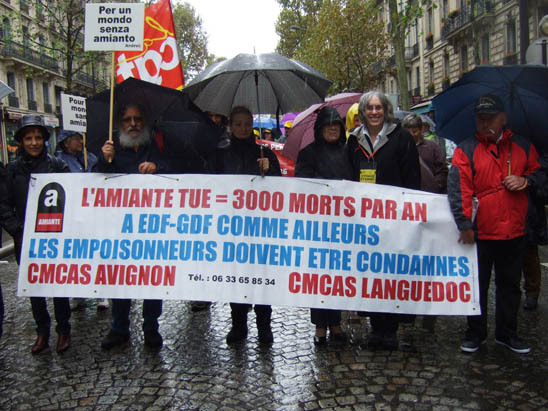 I had brought a bright yellow banner with the slogan Justice for ALL asbestos victims in English and French written boldly across the middle. Along the bottom of the banner was the IBAS logo along with the logos for the June Hancock Mesothelioma Research Fund, the Mick Knighton Mesothelioma Research Fund, the Asbestos Victims' Support Groups Forum UK, the GMB trade union and the Hazards Campaign, British actors in the campaign for social justice. As the demonstration commenced, the banner was carried by colleagues from the Commonwealth: Canadian Member of Parliament Pat Martin, Australian Senator Lisa Singh, myself (UK) and my friend Jennie from New Zealand. As people came and went we had a myriad of folks helping out. At one point a young man called Julien arrived to lend a hand with his girlfriend and his cousin Erika Capobianco. As we walked down the road, I asked him why his family was there. This was what Julien told me. On December 22, 2011, Julien's 76-year old grandfather Joseph Capobianco died of lung cancer. Since 1981, Joseph had lived in a city close to Lyon where he had been employed as a carpenter. Joseph had worked in many buildings which had been contaminated with asbestos and his disease had been recognized as having been occupationally-caused. Julien, his grandmother Marie-Louise, his father Patrick, his mother Michèle, his Aunt Sylvie and his cousin Erika were all marching in Joseph's memory. Looking at the thousands of people crowding the streets, it was hard to grasp the harsh reality that each one had either lost a loved one or was themselves suffering from an asbestos-related disease. It was clear that despite the great loss experienced by the Capobiancos, the family wanted to honor Joseph's memory by increasing the visibility of other sufferers. So, they marched in the rain through a crowded Parisian street carrying a British banner. It was an honor to march alongside them. As we reached our destination, the Place de l'Opéra, the rain stopped. Within minutes patches of blue sky began to appear. We filed into the square and assembled facing the stage in front of the Opera House. As the names of international delegates were called out, we made our way onto the stage. Andeva's President, Pierre Pluta, greeted the marchers and with some emotion thanked all those who had participated in the demonstration. Then one by one the national representatives were called to the front of the stage to be acknowledged. As we stepped forward waving our countries flags, the crowd responded warmly with applause and whistles. Looking out on the mass of people in front of us was an astonishing site: a public space in the center of a European capital crammed with citizen-activists calling for asbestos justice. As the demonstration wound down, I was thinking of Joseph Capobianco, his family and all the other families in France and beyond who had been devastated by the tragedy of asbestos-related disease. 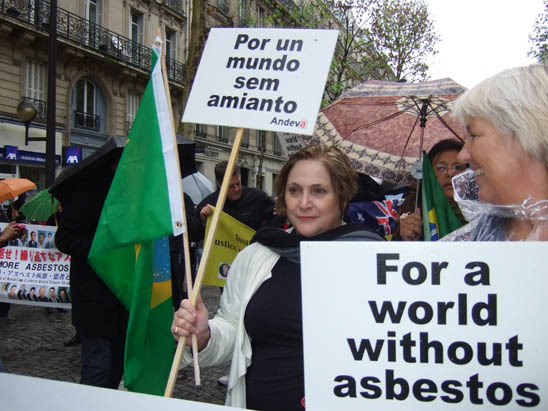 At the end of Andeva's first international event, we said our goodbyes in a spirit of friendship and solidarity and with our commitment to end the asbestos scourge having been reaffirmed. La lute continue (the struggle continues). 1 Agenda for October 12, 2012. 3 Kazan-Allen L. Global Asbestos Congress 2004. February 11, 2005.